Improvising lyrics and music this 5-piece brass band deals in the traditions of swing, ska, funk, jump blues, and more. 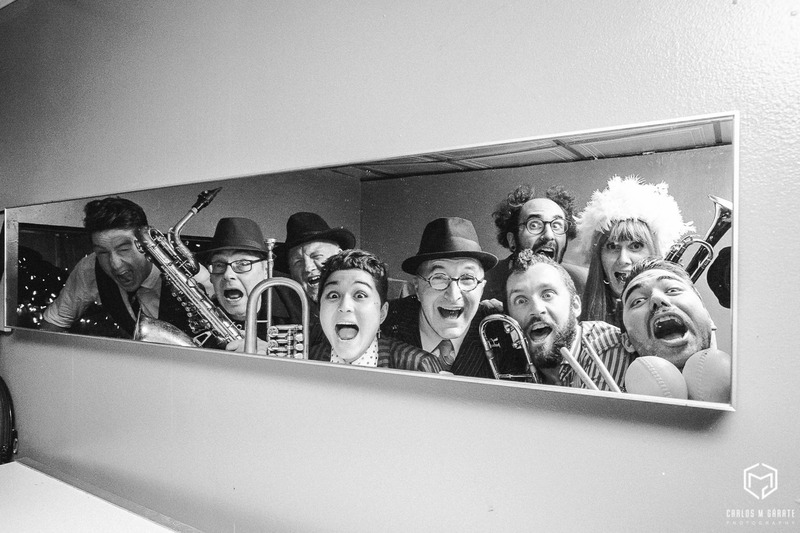 It is pure cabaret: a band of characters ripping it up with the freedom and careless spirit of a punk band, fronted by the charm and wit of a veteran entertainer. “You make up a song title, We make up a song” is the band’s motto. They get a title from the audience, decide a key and a form, then launch into a new song, complete with lyrics, harmonies, choruses, the lot. But be clear, this is not some experimental artistic exploration, it’s a party. 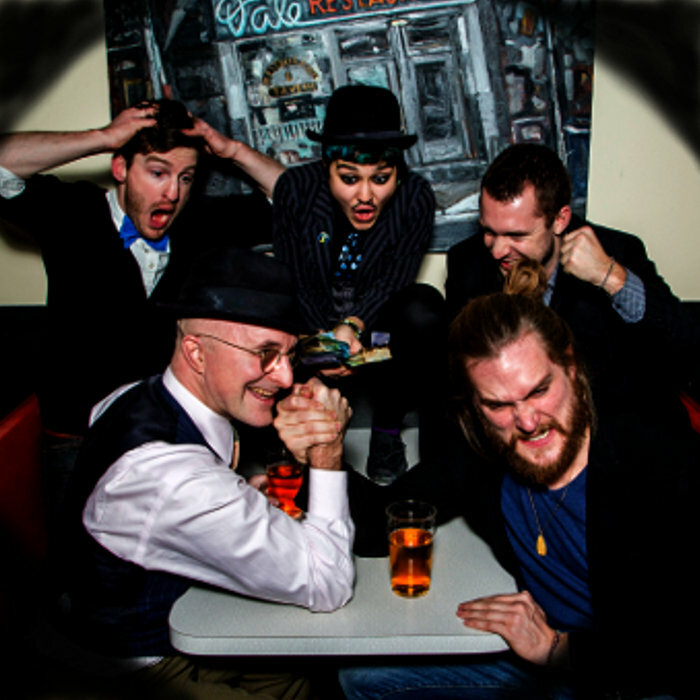 Little Rambunctious is lead by Michael Louis Johnson, notorious singing bartender at the Communist’s Daughter who spent most of the `90’s with SwingPunk legend Big Rude Jake, `03 to`07 fronting his punk band, The New Kings, and who currently tours with Balkan, Guerrilla-Folk rebels Lemon Bucket Orkestra. 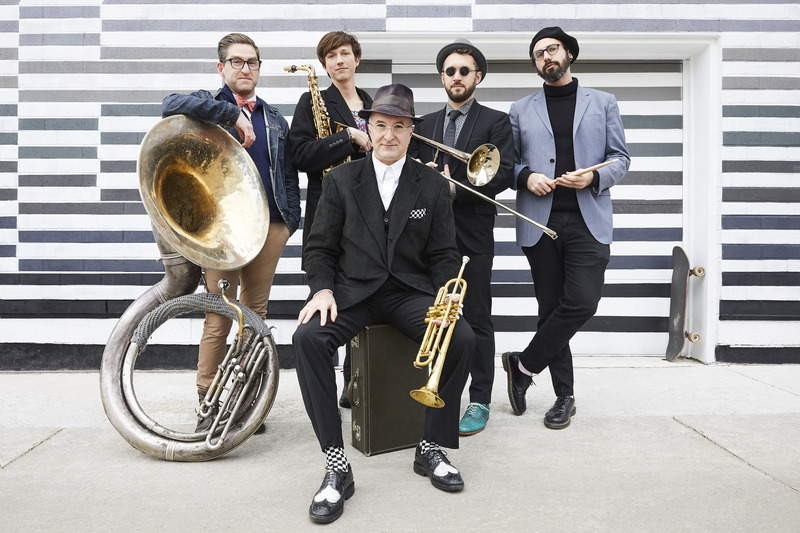 Ian Tulloch on sousaphone and Nathan Dell-Vandenberg on trombone are also with LBO, while drummer Benjamin Hackman and Ben McCarroll-Butler on sax, are members of the critically acclaimed group, the Holy Gasp. Little Rambunctious formed in October 2013 and has enjoyed weekly residencies at the Whippoorwill, Civil Liberties, the Tennessee Tavern and Drom Taberna. They have performed at the Junction Music Festival, Small World Music Centre, In Future Arts Festival (at the former Ontario Place grounds) and Laugh Out Loud Comedy Festival in Sudbury. They often book side gigs for Little Ram when out on tour with Lemon Bucket Orkestra, so have also performed in Recklinghausen and Berlin, Germany, at the Edinburgh Fringe in Scotland, at the Kilkenny Arts Festival in Ireland, and at WOMAD New Zealand.